We had a paintout at John Muir National Park in Martinez today. 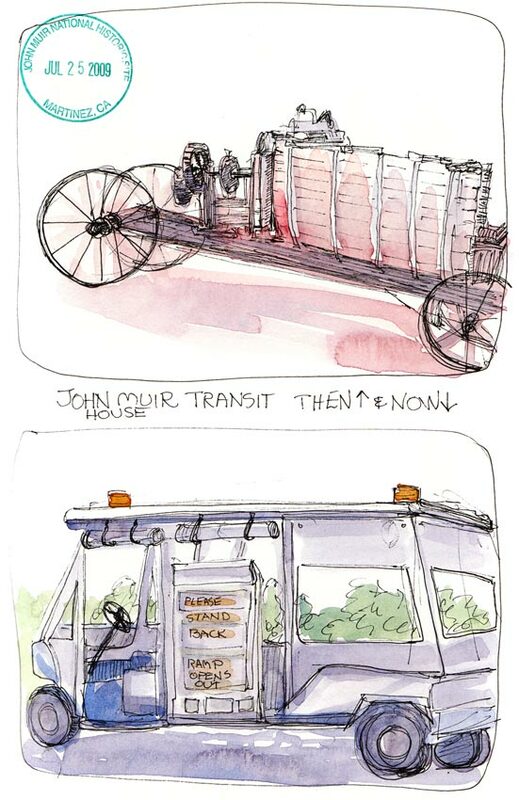 My painting was complete rubbish, so to leave with pleasant memories of the day, I stayed and sketched these two carts that were on the patio behind the visitors center. I wrote “Transit Then and Now” on the page but the ranger corrected me when I handed him my sketchbook to get it stamped (see stamp top left). He told me the “Then” wagon is actually a sprayer: the wooden barrel was filled with tobacco juice that John Muir’s farmhands sprayed on the fruit orchards to kill pests. He said that modern organic farmers have rediscovered this effective technique and are using it again. The “Now” cart is a neat little electric car they use to get around the beautiful hilly property. The rangers were so helpful, eager to share their knowledge about the park’s history, and very welcoming to the 21 of us who came to paint today. Unfortunately I’ve apparently forgotten everything I knew about painting in oils plein air in the month that I’ve been focusing on acrylic painting in the studio and sketching with ink and watercolor. But at the critique several people had helpful suggestions about saving my painting. I’d started with a bad composition (despite trying out several thumbnails first) but they reminded me I could use artistic license and change the scene to improve the composition. (DUH! I can’t believe I didn’t think of that!) In fact, many people in the group did just that, deleting one or both tall palm trees that stand in front of the house and evenly divide the scene. I’m going to give their ideas a try and who knows, maybe I’ll be able to rescue the painting. But not tonight. tobacco juice! but where do you get that? How interesting to hear that there are ways to step in and rescue a painting, particularly by just deciding that what you are looking at need not be rendered with absolute accuracy. *Tobacco water* or *tobacco dust juice* is a traditional organic insecticide used in domestic gardening . In *The English Physician Enlarged* of 1681, Nicholas Culpeperrecommends tobacco juice to kill lice on children’s heads, referencing it as an insecticide poison. Farmers have been using nicotine sulfate insecticide since the early 1800s. Tobacco water is produced by boiling strong tobaccoin water, or by steeping the tobacco in water for a longer period. When cool, the mixture can be applied with a spray, or ‘painted’ on to the leaves of garden plants, where it will prove deadly to insects. Yes, nicotine spray does kill bugs…and just about everything else!In concenttration, it’s one of the nastiest and deadliest poisons. If anyone wants to “brew” it, please seek advice on safety. Ok, commercial over! I love the carts, Jana. And maybe you can get your oil painting back. At least you keep at it, unlike me! Yup. Medium-switching is tough. It happens to me all the time, when I change up from one medium to another. Like you can’t find that part of your brain or something. Know the feeling well! Don’t worry, it’s there, just creaky, you’ll get it back! Thanks for the encouragement Nel. I’ve been reading your Oil Painting Online, though not chiming in, and I just read about your experience with water soluable oils. Talk about medium-switching! At least I’m switching between artist-quality functional paints (so no excuses!) Today I think I found some of the solutions or at least explanations for the problems I’ve had, and have written up a cheat sheet for myself for plein air painting about the steps I want to take which I’ve taped to my paint box. Jana, your sketches are just wonderful! Thanks so much for sharing them! Jana, I hope you never give up these wonderful sketches of machinery. They have so much personality! These are lovely sketches, Jana. I’ve lived in the Bay Area a while now, and hadn’t heard of John Muir house before. Sounds like it may be interesting.